**AVAILABLE IN RED, BLUE, ORANGE, BLACK AND ORANGE AND BLACK** Perfect for holding bikes upright for towing purposes or space saving storage, the Titan Bulldog wheel chock is extremely secure and simple to use. With its dual action EZ-Load rocking and Cam Clamping design cradle, the Titan wheel chock is unique to all others on the market today. Perfect for holding bikes upright for towing purposes or space saving storage, the Titan Bulldog wheel chock is extremely secure and simple to use. As your bike rolls into the chock, the rocking movement of the cradle allows you to effortlessly load the bike while it simultaneously clamps around the tire to properly hold it securely and in place. This heavy-duty steel constructed Titan wheel chock has three cradle positions to accommodate most wheel sizes and a safety latch to keep your bike safe and secure when loaded. All of Titan's products are designed with customer safety in mind and are produced in ISO 9001 factories with standards that meet and, in many cases, exceed the typical industry standards. 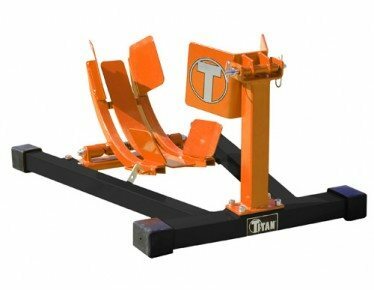 NHProEquip is proud to offer this line of versatile and high-quality Titan products. Being automobile enthusiasts and motorcycle riders who are involved in the local collector and riding communities, Titan understands the kind of equipment people are looking for and always put the customer first whenever new products are designed. All the Titan Lifts are built with high-grade material and are made to stand up to some serious work loads. When it comes to Titan you can be sure that there is Nothing Stronger.